There is no question about the quality of Janome 7325. But you have to keep an eye on the price as better alternatives are available from Janome itself. CLICK HERE to read what other buyers say about Janome 7325. Janome 7325 is the younger brother of 7330, we all know how good 7330 is. So one must expect 7325 to have the same quality of 7330 (or somewhere close). Somehow 7325 isn’t as popular as the 7330, so there is something for us to dig in. 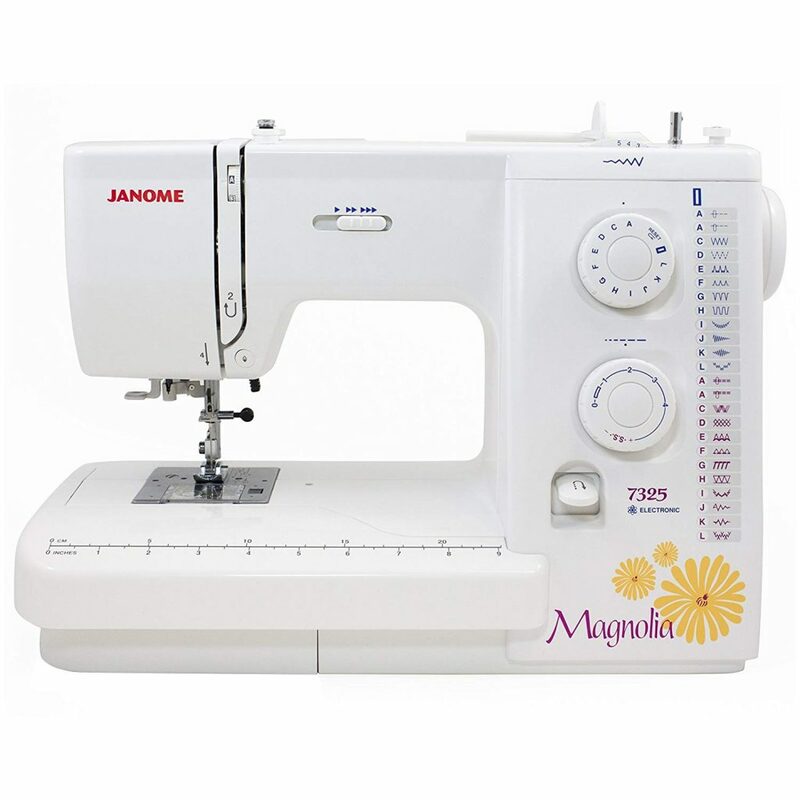 Janome 7325 comes with a total of 25 built-in stitches including a one-step buttonhole. The top drop-in bobbin not only makes it easy to change the bobbin but also gives you an option to keep an eye on the thread supply. The thread tension is automatically controlled according to the type of fabric. The automatic needle threader makes threading the needle effortless. The presser feet are snap-on type, so you can change the feet in a flash. Programmable needle up/down feature is the main highlight of this sewing machine. It is an important feature for quilters. It comes handy while pivoting or removing the fabric. It is one feature that most beginners overlook. Programmable needle up/down vastly improves the usability and versatility of a sewing machine. The sewing speed control slider is another feature that beginners will love. Janome 7325 can stitch at a maximum speed of 800 stitches per minute. But if you want to go slow, you can set it in the lowest speed settings. Lower speeds work the best for beginners. The oversized reverse sewing lever is conveniently placed, so that you can switch to reverse sewing in one motion. I really like the size of the lever as it will be helpful for old people to spot it. Janome 7325 comes with dials for stitch selection and adjustments. Stitch width and length are also adjustable (dials are provided for it). The maximum stitch width is 5mm and stitch length is 4mm. An extra high presser foot lifter is provided for offering better clearance while sewing multiple layers of fabrics. A built-in accessory storage compartment is provided for storing all the accessories. The machine can be converted to free arm by removing the storage compartment. Free-motion quilting is also possible, thanks to the drop feed option. Another notable feature is the option to adjust the presser foot pressure. Most machines come with automatic presser foot pressure sensors, which will work for most of your sewing needs. But an option to manually adjust the presser foot pressure comes handy at times to make that 100% perfect finish. A manual thread cutter is also provided underneath the face plate. The machine weighs around 18 pounds, which is a clear indication that Janome has controlled the use of plastic on this machine. Honestly speaking, I always found Janome machines better built than most other sewing machine brands (in the beginner machines category). The machine comes with an included hard cover as well. Janome 7325 has 25 year limited warranty cover. Janome 7325 looks very much like a good old mechanical sewing machine but blended with some modern day computerized features. The overall build quality is excellent (which you normally expect from Janome). The variety of stitches are quite good. The quality of stitches are also very impressive. Janome could have included a sewing start/stop button to sew without the foot pedal. Without the start/stop button, the speed control slider feature looks like it doesn’t perform its full function. It depends on the price. Janome 7325 is not a bad machine at all. But it could have made better if it had features like start/stop button, locking stitch button etc. So my advice will be to compare the price of 7325 and 7330. 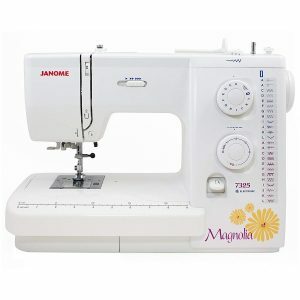 If the price difference is not more than $50, you will be better of buying Janome Magnolia 7330. It has 30 built-in stitches, start/stop button, locking stitch. It is a fully computerized machine and it has better feedback from users.